Android Push Notifications serve as the holy grail for customer engagement & activation in the current state of affairs. Here you shall understand the nuances of configuring the same for your app, in conjunction with using it for triggering AppVirality backed Rewards’ Notification in a synchronous and automated manner. Now, click on Create Project to create new project. Once you have created a new project (or if you already have an existing project), you will be taken to the console’s dashboard. This 12 digit number will be your Google Sender ID, which you will need to use in your code to register your application for push notifications. 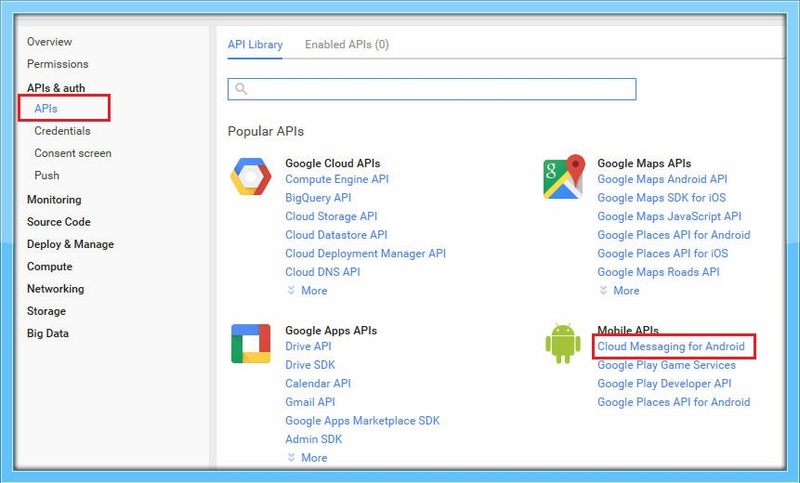 From the Google Developer Console page, select the APIs section under “APIs & auth” from the left-hand navigation. 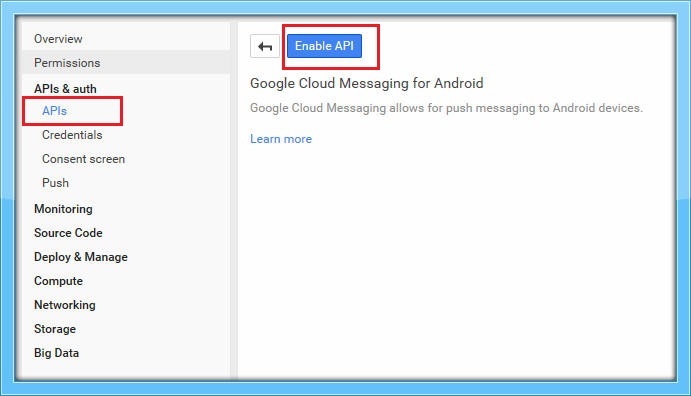 Find Google Cloud Messaging for Android in the list of services under APIs & auth, and turn it ON by clicking the switch at the top of the page, as shown below. 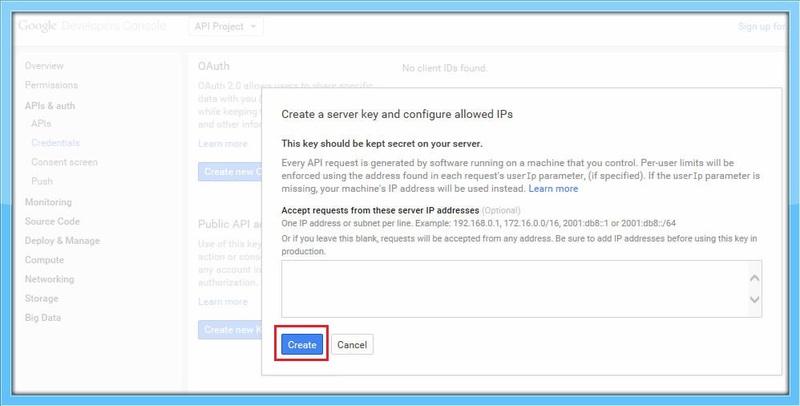 Then click “Credentials” under “APIs & auth” to generate an API key. 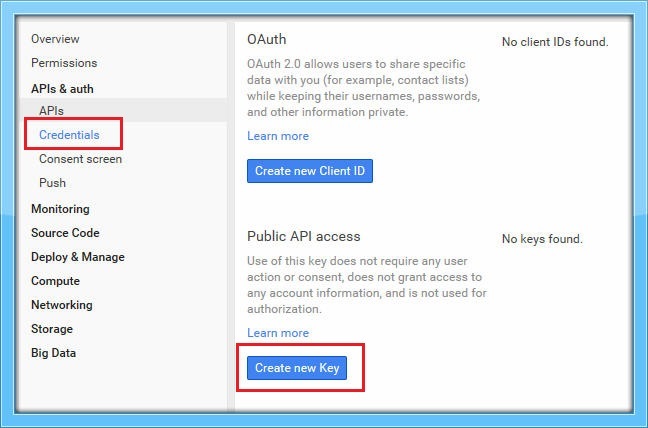 Now to create an Google API key, click Create new Key under Public API access. When you should see the following popup, click the Server Key button. If you are already using push notifications, you must have already obtained user push registration ID which is required to send the push notification. Create a new class GCMRegistrationIntentService.java extending IntentService class to register the device with GCM/FCM and hence acquire the Push Token . Override the onHandleIntent(Intent intent) method, fetch the Push Token inside it and store it on local storage. We already have given this file in the AppViralityTestApp module, so, please find this file and change the following line by replacing the text YOUR-SENDER-ID with your Google Project ID i.e Sender ID – the same whose creation we displayed in Step 1. This service will fetch the user push registration ID from GCM and update the same with AppVirality automatically. NOTE: If you are using the GCMRegistrationIntentService.java to register the device as shown above, you don’t have to call the updateAppUserInfo() SDK method to update the Push Token with AppVirality. In order to receive and build the push notification, we have provided a Service Class with the name GcmCustomListenerService.java which is available in AppviralityTest module, it extends GcmListenerService class whose onMessageReceived() method we need to override to receive the notification data and further creating the notification using it. Implement the same & get going! Create GcmInstanceIDListenerService class extending InstanceIDListenerService and override onTokenRefresh() method to get notified when the GCM/FCM token needs to be refreshed, and thereafter refresh the token. // Fetch updated Instance ID token and update the same on over server. Add the following permissions required to receive the push notifications. 3. Declare GcmCustomListenerService, subclass of GcmListenerService, to be used for receiving the notification data and creating the notification. 4. Declare GcmInstanceIDListenerService, subclass of InstanceIDListenerService, to be used for handling Instance ID service notifications on token refresh. 5. Declare Service Class GcmRegistrationIntentService, to be used for registering a user on GCM/FCM so push notifications can be sent to them. All the above steps were simply preparing your app for the Push Notifications. Now you shall configure the Push Notification settings on the AppVirality Dashboard. 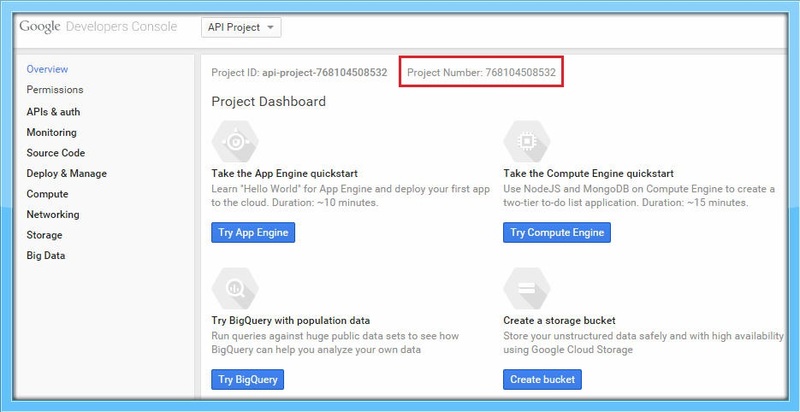 For AppVirality to send Google Cloud Messaging/Firebase Cloud Messaging notifications on your behalf, you will need to submit the Google API key(for GCM) or Legacy Server key(for FCM) generated by following step 1 above. This implies the New API Key you generated for the Public API Access section in your Google Cloud Platform. In case of FCM, you can find the Legacy Server Key from under Project Settings -> Cloud Messaging for your app on the firebase console. The way to do that is as simple. 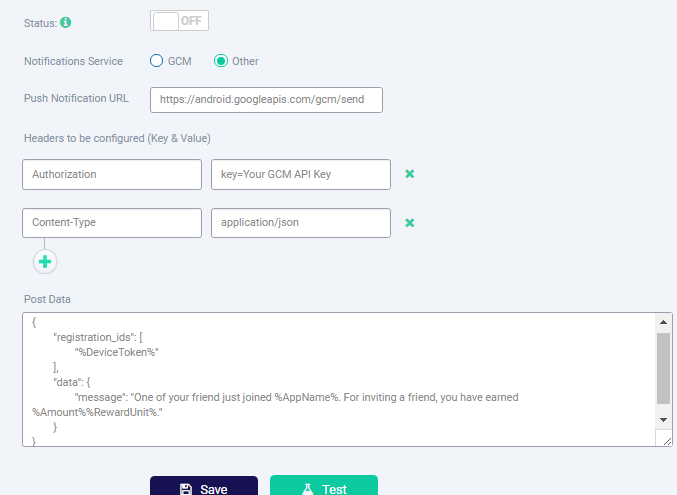 Now, configure the push credentials for your app by adding the GCM API Key/Legacy Server Key for Android in the respective field. Push Messages are pretty slick way to engage your users. While there could be a varied set of use cases for notifying users (differs app to app), we have covered a few basic ones & have put in place a set of few templates. You can select any of the 4 predefined templates, or simply move ahead with defining your own custom push template. Do remember to use the Replacement Tokens and add that personal touch. One must remember to toggle or switch ON the respective push template, to ensure that particular template gets fired. Also, remember to keep an eye on the platform: iOS or Android, for which you switched on the template. Having stated the above, you must know that AppVirality allows you to use Third Party Push Messaging services, and hence enables you with the respective customization hooks. If you employ any such third party push notification service, simply toggle the Notification Service to OTHER. Next, add the Push Notification URL for your 3rd party push messaging service. Hereafter, you may need to add Headers for additional validations – which is also available as a multiple key-in field set. Add as many as you may like. Save your changes & get rolling! In case of GCM notification service, compose your desired message in the text-box. The push notification receiver will receive the message as part of data object as below. If complex JSON data need to be sent, then compose the message according to the your custom JSON format.